Update: The giveaway is now closed. Thank you to all who commented, listened, and shared your suggestions with us! Thank you so much for this podcast! I am inspired to get cleaning and teach others about why essential oils are so much healthier for their homes and their families. I love my Thieves essential oil and household cleaner. I have not had the opportunity to purchase the laundry soap and other Thieves products yet. I haven’t tried the laundry or dish soap yet. I have the laundry soap coming this month with my ER order. I can’t wait. Replacing all of my home cleaners for thieves has been one of the best decisions yet. I have switched to using Thieves to household cleaner to use my house and absolutely love it! It smells wonderful, works fantastically and is so convenient. It is so comforting that I can breathe it in and know there are no harsh chemicals! I love thieves!!! I use it every day! Couldn’t imagine my life without it!!! I use Thieves cleaning products daily. I used to clean with harsh chemicals for years and then learned how toxic it was and unhealthy not only for me, but my family. Thieves Household Cleaner is amazing! I use it on everything. For my shower, I mix it with baking soda to help with soap scum build up. It cleans beautifully and I have peace of mind knowing that my family and I are not being exposed to toxic chemicals. I love everything about the Thieves line. It’s harsh chemical free and I love cleaning with it cause it makes everything smell so good!!! It’s the only cleaning product I use!! I love the laundry soap and would love to try the cleaner! I’m currently using store bought chemicals for cleaning and laundry. We have a baby on the way and are really looking forward to using these products! Once we can afford them we’re buying them . So excited! Wow! 25 years of Thieves! I would be extremely excited to receive the laundry soap. I already add a drop or two in my laundry for a fresh clean scent. Thieves is my go to oil for practically everything! Add to my shakes in the morning to help me feel energized, drop on a sponge while I’m doing dishes. Spray on my bedding, couches, car to refresh! It’s one of the best oils I’ve used! I am looking forward to replacing all my household cleaners including bleach and bathroom cleaners. I love the cleaner and can’t wait to try the laundry detergent! Can’t wait to try Thieves Dish Soap, it going to be the next thing I switch out!! Already love so many things Thieves!! I love my thieves essential oil and household cleaner!! I am excited to try the fruit and veggie cleaner and continue to make my household harsh chemical free!!! Thieve cleaner has transformed my life! It’s the only cleaner I ever use and I couldn’t be happier! Not only does it smell great when I clean it’s more efficient. Mixing baking soda with thieves cleaner has cleaned everything from my oven, to my shower and toilet ? Window seals- thieves cleaner first, sprinkle akin soda, pour in vinagear… summer cleaning! ? I love the thieves householder cleaner as it can replace everything! The laundry detergent is also amazing and is the perfect stain remover as well. I love my thieves cleaner!!! I haven’t got to use the soap yet but would love to. Thieves EO and lemon are a staple in my house. I’ve only had a sample of thieves but I loved it when I used it. My girls are huge young living oil users also. I’m slowly getting into them. I would love to win this bottle of thieves as I’m forever telling everyone to use the oils because I’ve seen how wonderful they are. Would really love some Thieves laundry soap!! Can’t imagine my life without all of the thieves products!!!! Love them all!! I’m new to Young Living but I LOVE thieves!! I’m super excited to try their laundry detergent! Just got an order of thieves and anxious to try it. I had used essential oil thieves for carpet that had got moist in a small area and smelled sour. I put the oil in spray bottle with water and sprayed on area. Fresh and clean smelling. After hearing friends rave about this product and the podcast, I’m excited to try the thieves household cleaner. More than ever, it’s important to change my cleaning supplies over to naturally derived cleaning agents since I have little ones. Can’t wait to try the laundry detergent oills are great. I love my Thieves!! I use it for everything. Looking forward to making toilet and bath bombs! I think they’ll be great as gifts ? I finally got rid of my other detergents and am only using Thieves cleaner and hand soap. It was really hard to not grab the other detergents. One day I just said if I am going to do this, lets geter done! Young Living came into my life at such a great time to start my journey harsh chemical free. How the heck do make your own commment?? I want to try the laundry detergent sooo bad. Thieves is one of my favorites!!! I was amazed at how thieves household cleaner was able to get the thick layer of bacon grease off my glass table on my deck. I love the smell. The entire Thieves line of products is amazing!!! The hand sanitizer is my second favorite!!! I love thieves. It helps with colds and if you clean with it then at makes it a double win!! I love pretreating stains with thieves cleaner and the stain stick from the YL blog!! I just recieved my Thieves cleaner in the mail this week. So excited to start cleaning with it. This podcast was a blessing at the best time. I love using thieves with lemon in a spray bottle, it smells delightful, and I feel comfortable using it everywhere! Love the smell of thieves. Use thieves cleaner, lemon EO and baking soda to scrub kitchen and bath surfaces. Can’t wait to try DIY laundry sticks. Loved listening to this podcast. Bought Thieves cleaner my first order and love it. Loved hearing the encouragement of why it is important to replace household cleaners with a naturally derived cleaner. Next steps is replacing detergents in the house– maybe this giveaway will get me started! Thieves is the oil that made me a believer in the power of essential oils. I’m a school teacher (preschool and kindergarten) and I use Thieves oil both at home and in my classroom. I recently purchased the toothpaste and so far am loving it! A friend of mine let me take the rest of her thieves cleaner once to clean my house and it was hands down my favorite cleaning product so far!! I am so grateful for this magical blend ? I love Thieves cleaner. I add a tsp of vinegar to my spray bottle to help leave Windows streak free. I also add a few drops of citrus fresh because I love the smell. I love my Thieves household cleaner . I use it and baking soda and vinegar to clean my toilets ! I use the thieves in my kitchen on everything. I an not wait to use it on my clothes…. I love Thieves Household Cleaner. My husband is so finicky and disliked the cleaning products I used. He would come home from work and turned grumpy the minute he walked in the house when he’d get a whiff of the odors of the cleaning products I had used to scrub the floors or clean the shower/tub, etc. that all changed when I switched to Thieves!? I love Young Living Essential Oils and now ready to try make over with home cleaning?? I am new to essential oils so I don’t have very many yet. In the near future I would like to try the Thieves Household Cleaner, it’s on my wish list. I love theives oil!! And can’t wait to buy these products to start cleaning my house ? I love podcasts and all these products are amazing! I have been so impressed with Thieves Essential Oils anyway I have used it, whether topically or in my mister. Would be great to try the Thieves laundry soap and Thieves household cleaner. I’m so excited to start my young living journey! I’ve heard so many wonderful things about Thieves! One step at a time to a healthier living! Thank you so much. I am just getting started and one of the first things I want to do is switch out all my cleaners. I am a mom of two boys so the toilet is always dirty. I love to add some lemon to my Thieves cleaner spray! I love that I have replaced nearly every cleaner under my sink with this one bottle! It’s safer and smells better by far. Love Thieves! I have replaced so many other cleaning products with this one!!! Ever since I’ve been into essential oils it has really motivated me to clean with better products that I can make at home! Nothing will harm me or my family! I love telling people about it too!! I cannot wait to try thieves laundry soap! Great products for our home! Thank You, Young Living! Love all the Thieves infused products! Ohhhh I just love YL and the thought and care that goes into making each product! Can’t wait to finally try these! My daughter works in a dehli, she comes home with grease all over her clothes. The chair she sits in had grease off from her clothes. I sprays some Thieves Cleaner on it, brushed it and wiped it off with a clothe. That a difference. It cleaned off the grease. I love this product. I love all things Thieves! Great podcast! I absolutely LOVE that I have switched from name brand household cleaners to the Thieves Cleaner! I’ve also started to use a drop or two of Lemon EO to the cleaning solution for an even cleaner smell!!! I use the Thieves Cleaner on EVERYTHING!!! I’ve even gotten my daughter hooked on it! Cant wait for my next order to come because I’m switching out my laundry detergent for Thieves detergent!! WOO HOO!! I love ❤️ the thieves products! All of them! I make some of my own cleaning products with thieves as well as enjoy ? many of the YL products. My grandson loves the Thieves Foaming Handsoap! I still have not switched out my laundry soap and I would like to try this product! I love Theives cleaner & use it for everything! Makes the house smell so good! I LOVE Thieves! I’m starting to use it more and more… both in my house and in my barn! Musty and dusty are no more! We love using Thieves Cleaner in our home because it’s the most safe and effective way to clean up after two toddlers and a dog! Thank you YL for quality products that are safe for our family! Love making thieves dish soap, even used thieves as a jewelry cleaner! I love thieves…made up a small spray bottle of thieves essential oil and water and love it. Can’t wait to try the cleaner and laundry soap. Would love to try the detergent! I’m excited to try the dishwasher soap as my home made remedies never work that well. Thrives cleaner is all around the house. I trust it on all our surfaces and around the kids toys. I love the Thieves cleaner, the smell is awesome and it works really well on greasy things! Really looking forward to trying the laundry soap to get that same great clean to my clothing. I look forward to making a window cleaner with the Thieves. Thanks for the chance! I love everything EO. I really want to try the household cleaner! I love Thieves! I’d love to try the laundry soap since I haven’t gotten to try that one yet! Love the household cleaner – cleans well and leaves a wonderful fragrance. Love, love, love all the thieves products & lemon as well. I’ve been with YL for 4 months now and was super excited to get the cleaner in the promo a couple months ago. I am completely in love with it and use it for everything from the kitchen counter to the mirrors to the toilets! I’m replacing everything in my home that is toxic and am *almost* there! I would love to try the laundry detergent as that is one thing I have left to replace. Currently I put thieves and lemon in my current laundry detergent until it is on the list to replace. Slowly but surely!!! I love Thieves household cleaner! I’ve been adding a capful to loads of laundry to combat a chronically stinky washing machine. Can’t wait to try the laundry soap! I’m excited to try it all, but I really want to try the Household Cleaner! I am really excited for this giveaway! Thank you! I absolutely loved the podcast and thank you so much for this opportunity to win this amazing product. I recently just tried the Thieves cleaner and have fallen totally in love. I even use it to clean my fiberglass boat. Thank you! Had some mold on the bathroom ceiling that thieves cleaned right off. Makes the chrome shine,hard water spots come off everything is clean and smells so good! Have one more product for kitchen to get and that’s the dishwasher soap so excited to be rid of chemicals! Thank the Lord for Young Living it’s helping us change our lives!!!! I am excited to try the Thieves Laundry Soap! I haven’t used it at all but have heard amazing things! For the past couple years, I have been using distilled white vinegar as a fabric softener. I add 10-15 drops of a non-citrus oil, shake and add 1-3T to my laundry. My clothes are super soft and smell great without the yuck! I’m anxious to try this in combination with the vinegar (which doubles as a washing machine cleanser). We LOVE Thieves cleaner at our house! I’m really looking forward to making the DIY stain sticks with the Thieves laundry soap, that were posted a few weeks ago! Ever since I discover thieves cleaning products, I ditched everything else, absolutley love these products. I absolutely love the thieves line! I have replaced everything in our home using thieves products. It feels absolutely wonderful knowing that I clean everything thing from our teeth to our clothes with this amazing line. I’m excited to try thieves dishwasher detergent. It’s one of thieves items I haven’t gotten just yet. It’s really scary knowing what chemicals I used to use in our household. Great podcast! Thank you! Thank you for the podcast! I am interested in improving my overall health, switching to natural-based products, and educating others on the importance of utilizing essential oils in cleaning products and everyday health products! I have a sample of the Thieves household cleaner, and it’s AMAZING! My husband and I are currently in the process of buying a home, and I want to get the Thieves ER kit when we officially close! I am fairly new to using YL essential oils and it has truly been amazing. Having never used a diy cleaner, It would be such a great opportunity to try this Thieves cleaning kit. Excited to use the Thieves laundry soap as I am trying to switch to a nontoxic lifestyle! I love Thieves! It’s the reason I joined Young Living!!! Second: I LOVE how little laundry soap is needed to clean my family’s clothes! And it smells great! I have a front loader and I like to use a little white vinegar in the “bleach” area with a single drop of Purification – it gets out ANY foul odor…even that musty mildew after forgetting a load!! As for the Thieves cleaner: I haven’t found anything it can’t do! Just started using Thieves Laundry Detergent this month and I love it !! I add a drop of lemon to a spoonful and use as stain treatment. I will never go back to toxic laundry soap. This is awesome! Looking forward to trying Thieves Household Cleaner ? I love thieves!! All I use to clean my house. Trying to get my mom to use it too ? Just read a comment how their is an alternative to Bleach! I never though to replace bleach, though I know that is full of toxics! I read that we can do the lemon EO, distilled water and hydrogen peroxide. I would switch right away if there is an alternative to bleach, that would be safer and just as effective. I am interested in making the thieves stain stick I saw on another post – really could use this and was looking for a recipe just like this – fits the bill! I just placed my first ER order and thieves cleaner was in it! I’m so excited to try it and ditch the mainstream chemical laden cleaners my husband loves the smell of. I love the Thieves cleaning products. I love the Thieves household cleaner so much and it is so economical that I have been giving away an 8 oz. spray bottle of to people at my classes. I am confident that once they use it, they will want more. What a great podcast with some great tips for cleaning! I can’t wait to get home and try some of them! I have already replaced several cleaners with my Thieves Cleaner and can’t wait to replace more! What an amazing give away! I use the household cleaner for virtually everything, so I’m excited to try the laundry soap. I’ve just started with Young Living and love the products! I have not tried the thieves products yet but I am excited to! I love thieves with lemon and baking soda! I love Theives oil, toothpaste, and cleaner! I haven’t tried laundry soap yet. New to Essential Oils! First Young Living podcast that I’ve listened to. Really impressed. Lots of good info. I love the lemon scent and the spicy scent in Thieves. Would love to win this! I’m excited to clean with Thieves. I’m new to the essential oil world and am really enjoying learning all of the things we can do with them. Thank you!! Totally new to Youngliving and been wanting to try the thieves laundry detergent and cleaner. Would love this opportunity! I absolutely LOVE Thieves anything!! I have done the swap out and it’s all I use!! I’ve actually sampled it out so much that I’ve been through 5 bottles since March!! The laundry soap leaves my clothes so fresh and with a little around I like knowing I’m not harming him!! Thank you Thieves & YL!!! This was great! We have a toddler and I don’t want to use harsh chemicals to clean our home, thanks so much! Can’t wait to put in my order for Thieves kit this month! I adore my Thieves cleaner so nice to use something safe and cleans so effectively. I have an all purpose bottle mix for everything and then one for glass, amazingly only need one cleaner for everything now!! I would love to try the laundry soap! Love love love thieves cleaner! It has so many uses not only for my house but for my barn. Love how people come to barn and comment on how amazing it smells! I would love to try the Thieves Household Cleaner. I’ve have never tried YL cleaning products and this would be the perfect opportunity to try it out!! The lemon and thieves oils sound amazing as well, but I’m new to oils and am not sure how to use. I want to try the household cleaner. My hubby has a lowered auto immune system and the cleaner would be a perfect alternative to chemicals. I love my thieves laundry soap and thieves cleaner! I don’t have to be concerned when my 1 1/2 and 3 1/2 year old want to help clean. I absolutely love the Thieves Cleaner. I use it for all of my cleaning now. The difference it made on the grout in our tile floor was a game changer for me. Next on my list to try is the laundry soap. I would love to try the Thieves cleaner! I LOVE thieves cleaner! I use it on literally every surface of my house. I also use it as fabric deodorizer spray. This has been such an awesome addition to our home. I’ll never use anything else. Do you have the recipe for fabric deodorizer spray, love the smell. Excited to try Thieves laundry soap! Thank you for this podcast. I absolutely love the thieves cleaning products. We have tossed all the toxic cleaning products from our home and are using the thieves products. They smell great and are so effective. I would be thrilled to win the Thieves Giveaway!! I LOVE Thieves and use it for everything around the house. I love all the Thieves products! I use the household cleaner on practically everything! Windows, appliances, highchair, floors… love the cleaning power! I have theives cleaner all over the house. I trust it to clean all my surfaces and keep the kids toys clean. I would love to try the laundry soap! Great podcast! I love Thieves Household Cleaner and am excited about the DIYs Haley shared! I would love to try the laundry soap. I love the thieves cleaner, it smells so good! I love thieves, I use it in my necklace diffuser instead of perfume. I’m just getting started, my Stater Kit arrived today. But I’m excited to learn all about Thieves and start using those projects. I would love to try the thieves bleach alternative diy cleaner! I’d love to try out these products in my home! I love the entire Thieves line. I use the Thieves Household Cleaner for absolutely everything. Haven’t made the laundry switch yet, but it is on my list! I have yet to try the thieves cleaner but want to make the switch! I am slowly getting rid of all toxic chemicals and would love to start using thieves household cleaner! Love the Thieves line of cleaners!! My mom is starting to use the Thieves Household cleaner and is in love with it. I can say I was not a fan of thieves at first as smell was fairly strong for my taste, but I see all the benefits of using Thieves versus other household cleaners and cannot deny that it is worth trying! Thanks for the information! Thank you so much for all the great information. I love cleaning with my new products. I’m so in love with all Thieves products and have been slowly but surely replacing every single cleaning product in my home. I love how versatile the Thieves Household cleaner is and that you can even use it to pretreat stains or in place of your dishwasher detergent if you run out….I’m excited to try it for the hundreded of uses I have seen mentioned as I get more and more familiar with it! Thanks for this podcast too….always such great information! I just ordered my thieves kit and should arrive today or tomorrow. I can’t wait to try all these products. I just started using the cleaner, love it! I wanted to order the dishwasher soap as well, but it’s Los. I love love Thieves, worth every penny! I’m no longer buying floor cleaner, counter / kitchen spray, bathroom cleaner, window cleaner, absolutely no more cleaning wipes of any kind, no need for air freshener, no candles,and no dusting spray. Man I’m probably saving more than just my Health! Everyone that walks in my house asks what I have going. I was lucky enough to purchase the thieves cleaning kit last month what an excellent combo! Keep up the good work! Thieves Household Cleaner for every room! I start high, lightly spritz a duster for fans & corner cobwebs, then walls spots/mirrors, counter tops/sinks, spot clean cloth furniture, toilets and then mop floors. Lastly, baking soda/Purification or Thieves EO sprinkled on carpet before vacuuming. Our home smells sooo fresh and clean. ? 1 by 1 we’ve been trying YLO Thieves products: first the Thieves Vitality in the Premium Starter Kit; my next order included the 15 ml Thieves Oil & the Thieves Dentarome Plus Toothpaste; the following month’s order we were Blessed to receive 3 Thieves Waterless Hand Purifiers as the promo so I shared those with my mother-in-law & with my bank teller friend; We really liked the toothpaste so I next ordered Thieves Dental Floss & Thieves Fresh Essence Mouthwash to add to Oral Hygiene routine; Lastly we received the Thieves Fruit & Veggie Spray as a promo. Thieves Laundry Soap & Thieves Household Cleaner are the 2 remaining Thieves products we haven’t tried…I’m so excited to have this opportunity to win these 2 Thieves products! I had been making my own Theives cleaning blend, but I just received a bottle of Theives cleaner in my order and I’m excited to start using it! I’m excited to try the shower spray!! I love all 4 of these products for the Giveaway! I have made great strides with Young Living products to getting rid of harsh chemicals in my home! I love that Young Living truly is more than just an essential oil company, but a health and wellness company empowering us with great products to live healthier and more vibrant lives! I’ve found so many uses for thieves cleaner! I use it not only for multipurpose, I clean my jewelry, make hand soap, splash for extra dirty laundry! Thank you for this chance to win! I like to use thieves in my carpet cleaner to get rid of odors from when our pets have accidents on the carpet! It works great and gets rid of odors better than the conventional carpet cleaners ? I love Thieves Household Cleaner!! I have two year old twins and feel awesome about cleaning around them!! My favorite recipe is for an on-the-go stain remover that includes 1 capful of Thieves Household Cleaner with distilled water in a 15 ml roller bottle. Super simple!! How long do you think this would last? I think it’s a great idea!! Wasn’t sure on longevity if I kept it in my purse. Looking to replace especially my laundry soap. Would to one day have one soap for all our needs including dog beds, and carpets. I also love the smell of theives and lemon. Thanks for the chance to win. Luv the podcast! I just bought some of the household cleaner and can’t wait to get cleaning and show others what is healthier and better for our environment! Who doesn’t want a cleaner that is all in one, as well as smelling great. I am excited to try laundry detergent and also to make my own window glass cleaner using the Thieves household cleaner!!!!! I absolutely LOVE Young Living Products!!!! I am so grateful that my babysitter introduced me to Young Living!! I have been using the oils ever since. I just ordered my first bottle of Thieves cleaner and am very excited to start using it and sharing how awesome these products are to everyone!! I adore Thieves cleaner! I can’t wait to make the stain stick! Oh Thieves cleaner has saved our house from ourselves. We are beyond excited about using Thieves and water in a spray bottle to clean everything. Thank you Young Living, you impact the WORLD! Thank you for doing this podcast 🙂 My favorite product is the household cleaner! I love how it is so versatile. Thieves are my best friends (ha!ha!) I keep it handy at all times? We love using the Thieves products!! So excited to try thieves laundry detergent! I already love thieves cleaner! I love Thieves and Lemon! Excellent for cleaning, laundry, and refreshing the air in my home. Thank you for this opportunity to participate in your Giveaway! I absolutely love my Thieves household products. It feels so good to clean with products that benefit your family rather then harm them. Thank you Young Living! I am looking forward to trying Thieves laundry detergent. I love using the Thieves household cleaner. I use it for everything in my home and our RV. I use it to keep mildew at bay with a spray mix & 10 drops Tea Tree Oil added to it. We use Thieves toothpaste, which we love and use Thieves vitality in capsules daily to support our health. Love it in warm water as tea. Heidi, what is your recipe for your mildew spray? I love Thieves! Use the cleaner on every surface of my home and diffuse it regularly! I am excited to try the Thieves Laundry Soap! It is the last household cleaner that I have that I need to swap out for a harsh chemical free home! I’ve not tried the Thieves Laundry Soap. I’m hesitant because what I currently use cleans so well and I prefer unscented soaps. Love Thieves Household Cleaner for all my cleaning! Love all Thieves products(have most of them) Use the laundry soap every time! Love Young Living!! Love educating other people on Thieves Cleaner & have given away many samples, as well as other Young Living products. I am excited to try the laundry soap. I would love to try a diy on bleach also. I absolutely love Young Living cleaning products! Thieves household cleaner is my favorite because it can be used in so many ways, on multiple surfaces, and because it’s made with naturally derived ingredients I don’t have to worry about it affecting anyone in my home in a negative way. I can’t wait to try the Thieves cleaner. I just signed up as a presenter. I would love to win this giveaway. I want to share this cleaner with others around me to show them that there are healthy cleaning supplies out there without the harsh chemicals. I just tried a sample of theives and I like the smell . I think I would love everything in the giveaway. I also think its a good idea to be able to try products first. I would love to try the Thieves Laundry Detergent! I use Thieves EO all the time and my latest discovery is making my own Thieves Spray. We use it in our bathrooms as a room freshener and I use it in the kitchen to clean the kitchen counters. Works so good! My second favorite Thieves product that I have tried in the mouthwash. It works soooo good! Love the podcast and Thieves cleaner. My newest DIY (a simple one I know most have done way before now) is making thieves cleaning wipes using paper towels. Very awesome!! Thank you! I’m trying to change over many of our products in our home to Theives cleaners. Love thieves as well as lemon! It’s such a shame cleaning products are not required to be regulated. I live using Thieves in a spray bottle to clean and disinfect my home. Going to take the Thieves hand sanitizer to Disney World! So many germs from so many places. I’d love to be able to try these awesome naturally derived products that I’ve heard so much about. My son & husband have sensitivities, so i feel they would benefit, as well as the rest of us, from these products. Thank you for the possible opportunity. Have not used Theives cleaner but am so excited to try! Want to kick the bleach habit. I’d love to be able to switch over to a healthier household. Love Young Living products and especially the Thieves Household Cleaner — along with all of the other Thieves line of products!! Such and amazing product and what a blessing to know that it will not harm my family when used correctly. A healthier, greener option! Thank you for developing such an amazing product line!! I made diy thieves wipes!!! All so needed was a 1/2 Gallo jar good quality paper towels and water and 1 capful of thieves cleaner I also added some extra lemon EO!! You cut paper towels in half then place on jar in separate bowl mix water and thieves cleaner pour over paper towels I used about 2 cups of water! Thanks! Love my Thieves cleaner! I’m excited to try the DIY shower cleaner with vinegar, water and Purification!! Love the Thieves in the carpet cleaner, smells so good! I love this. I could use these. I love thieves. I have used other cleaners in the past and with all the harsh chemicals they don’t compare to thieves. I even used it to clean my carpeting by the front door . . . Wow did a great job and only used 1 part thieves to 30 parts water. I love using thieves cleaning on all my surfaces in my house. Works great on my windows! I like learning new ways to clean my house! I’m looking forward to trying the laundry soap! Always love your podcast!! Thieves cleaner is always the first product I pitch to others when they want to have a healthier home. I still haven’t tried the thieves laundry detergent and would love to try it. Just like Hayley, I make sure I keep a DIY bottle of thieves cleaner in every room of my house. Thanks again for this very helpful episode! I’m excited to use the Thieves cleaner on everything and clean out my under sink area. I love my Thieves cleaner! I have two spray bottles going at the same time. One with just the Thieves and water and one with that and vinegar as well for when you need that little extra boost. I have replaced every single cleaner in my home with Thieves! And I have my mom hooked on it as well, she just signed up! I have been wanting to make the switch to a harsh-chemical free home. I like the idea of letting my kids clean with safe thieves products. I want to try the shower cleaner. What an informative podcast! Loved the DIY recipes! Thieves cleaner is so versatile! I use it to clean everything around the house. Wow I never knew any of this. We all try to eat healthy and stay away from bad chemicals but who knew the common cleaners are that bad for you. We all trust the regulations are there to protect us. I have been using thieves essential oil only for about a year and LOVE IT. But have never tried any of the other thieves products can’t wait to start using them. Hi! Thank you so much for the podcast! It was very informative! I am excited to try a DIY dusting spray…..
Great info! I’m excited to try the shower spray and deep cleaner. I use the household cleaner and love it! I would love to try the laundry detergent! I’m so excited to start using the laundry soap! I love thieves! I’ve used the thieves household cleaner & I LOVE IT!! It smells & works wonderfully!! Thanks for the information! Live the “Think Dirty” app♡ Trying to use up & change put my products without breaking the bank, can’t wait to try Thieves cleaning, already love the EO, the toothpaste & fruit spray! I love using a capful of Thieves Cleaner in laundry for special loads as well as a few drops of purification oil…brightens the laundry and REALLY freshens it as well! I have heard sooo much about thieves essential oil to clean with. I have been so excited to try it out someday! Ive already made a switch to cleaning with natural plant based products and I love it! Having EOs around has been an amazing experience and I encourage everyone to try it out. Thanks for the podcast and having a keep our family home clean, mind set! I could not imagine a day without Thieves! The soap, the cleaner, the spray, the hand sanitizer..the oil blend. I promote this harsh chemical free product ALL THE TIME! I sample the cleaner any time someone asks about it. Thieves Cleaner is the best! We use it for everything! We also put a few drops of Purification into the washer, it makes everything smell so fresh! I would love to try Thieves house cleaner!! I love thieves EO and purification EO!! I can’t wait to try the laundry soap! I would love to get away from harsh chemicals in store bought laundry detergent. Thank you for my chance! I like the long-lasting, fresh scent it leaves after cleaning. I LOVE my theives cleaner from carpet stains, to countertops to bathrooms to my laminate floors! I have not tried the theives laundry detergent but that is high on my list of things to try! I have replaced all my various cleaners with thieves cleaner. I have the cap full in my glass spray bottle and filled on up for my counters, mirrors, tubs, surfaces. I don’t feel like I need to wear gloves using it, it doesn’t hurt to inhale near it, and it’s actually added motivation to keeping things clean. I’m really looking forward to trying the laundry detergent as my next replacement option! Thank you for the great podcast, and great giveaway opportunity! I will implement some of the DIY recipes from he podcast, like the toilet spray. I have used the thieves Household Cleaner for the first time recently, and absolutely love it especially in my kitchen!!! I love the smell and knowing that I’m using a safe product for my family. Before, when I used commercial cleaners on my counter tops, I always had to rinse afterwords because of the chemical residue and didn’t want my children to be exposed to that. After discovering the Young Living Thieves line, I am excited to try the other products. I actually made Thieves household spray cleaners for my friends to try and they love it!!! I’m excited about using the Thieves household cleaner. I hate the smell of bleach and all its chemicals. I remember growing up when they had the Mr. Yuck stickers that we plastered on any and every kind of cleaner and you are bound to be breathing in some of those harsh chemicals while you clean, and I love the smell of Thieves. I love that Young Living is offering so many options to switch to naturally derived cleaning products. My favorite DIY cleaning product with Thieves cleaner is a sink and tub scrub. Baking soda, Thieves cleaner, and YL Lemon essential oil. It’s amazing! I would love to win thieves, I would love to try the household cleaner. I am trying to stay away from harsh chemical products and make my own cleaning products so this would be an excellent addition to my homemade things I have as of now! I am in love with this product line! Thieves IS the BEST harsh chemical free wellness support there is on the planet! I haven’t yet tried the laundry soap or dish soap but I have purchased other Thieves products and Im never disappointed! I would be interested in trying the Thieves laundry soap. My daughter has sensitive skin and I would like to see how my daughter’s skin reacts with it. I have used the THC on everything and I love it. I am new to young living and I am slowly trying to weed out all harsh chemicals in my house! I would love to win some thieves cleaner! I love my thieves cleaner!! Would love to try the laundry detergent! Then I can make a stain stick and have my clothes be washed in something naturally derived! I have switched all my cleaners out for thieves household cleaner. I have also switched to thieves laundry soap and thieves dish soap. I LOVE knowing that my family is cleaning free of harsh chemicals!! I’ve used thieves and baking powder to deodorize carpets. Such a versatile product! Would love to try the cleaning solution. Thieves Laundry Soap would be fun to try. Already love thieves oil (use every single night) and cleaner. Sold on the oil supporting my health! We use all of the Thieves Line throughout our home, I share the 14 ounce size thieves household cleaner as Birthday and Christmas gift. A true Blessing. Thank you for this podcast! I love hearing how people clean their home with naturally derived, effective cleaners! How exciting! I would love to try the Thieves household cleaner! I absolutely love the Lemon and thieves essential oils. I’m so happy to be going harsh chemical-free in our home! I use everything thieves in our home. The not having to worry about harsh chemicals is a great relief. It smells like Christmas and cleans wonderful as well. I just started with YL and am already in love with being able to get naturally derived products. I can’t wait to try the Thieves line of products and take a more natural approach to everyday life. Thank you for sharing this podcast! I am constantly sharing with others my love for all things Thieves! I recently purchased Thieves Household Cleaner.. and I have no idea how I’ve survived this long without it. It works great combined with baking soda and a couple drops of lemon EO as a grout cleaner in the kitchen and bathroom. I am slowly getting everyone in my family hooked on Thieves! Love being able to clean with a natural plant based product!!! I am in love with the Thieves line of household cleaners!! It gives me so much piece of mind to know that the cleaning products I’m using around my one year old daughter, two dogs as well as my husband and I are safe, harsh-chemical free, and smell amazing. I love the spicy lemon scent Thieves has! I can’t wait to try out the laundry soap!! I have so wanted to try the thieves cleaner. It would be amazing to win this give away! Love oils they are amazing. I’m excited to try the Thieves Cleaner. We have a new grand baby in the house and I don’t want him exposed to all the harsh chemicals. Looking forward to swapping the toxin full floor clearer for thieves cleaner. I’m so happy learning about my new oily life. I diffuse Thieves in my living room. Guests comment how fresh my room smells. I use the Thieves spray in the bathroom instead of deodorizer. And, I use the laundry liquid on my clothing. I would like to learn more about the products. Thank you so much for this! I’m going to try these DIY’s! Sharing to inspire others to get cleaning with naturally derived cleaners! I am loving the theives line for what I have tried so far! Can’t wait to get more to replace the harsh chemical crap ? I want to make the degreaser ? We LOVE adding Lemongrass essential oil to our laundry balls! Such great, fresh laundry as a result… and harsh chemical-free!! I can’t wait to try both the laundry detergent & Thieves cleaner. Ready to get harsh chemicals out of my home. Love that Using Thieves Cleaner and laundry soap not only am I keeping those harsh chemicals away from my family but helping the environment! Love all thieves products! I’m gradually gathering all of the Thieves household products and I love the new bucket package! It is sad that it isn’t required to have warnings about cleaning our personal products. I love Thieves. I haven’t used many oils a ton, but this is one I was introduced to early, and I love knowing that’s I’m not using crazy chemicals, and getting better results! I’m excited to start the journey of a harsh chemical-free home using Young Living Products! I love Young Living products. I enjoy knowing that I have a harsh chemical free home. This is increasingly more important now that I have a newborn. I love learning more about these great products so I can encourage and teach others to start using them too! We love thieves bc it’s all naturally derived and I don’t have to worry about cleaning my babies toys and handing them to him with harsh chemicals still on them!! So happy to be taking the harsh chemicals out of my home! Thank you Young Living for giving me the tools to do it! Looking forward to using the Thieves Household Cleaner to make dish soap! I’m slowly yet surely switching over to harsh chemical free cleaners. Already started with the laundry soap, which smells lovely but doesn’t give me a skin reaction the way commercial cleaners with fragrance do. Love the household cleaner! My boys can clean their own bathroom without me having to worry about harsh chemicals. My whole house smells wonderful!!!! I have used the laundry detergent and am amazed how a little goes a long way. Sometimes I put a cap of household cleaner in heavy soiled laundry. Wanting to try the dishwasher soap next. I am excited to start trying the Thieves Laundry Soap soon. I use Thieves on a regular basis, and I love it. I also use lemon, and I like the smell of it. Thieves not only helps me to eliminate harsh chemicals in my home, but it cleans all areas of my home so easily. Some cleaners that eliminate harsh chemicals do not work well. Thieves cleans every surface of my home, and I love the smell! I absolutely love my thieves cleaner. It cleans EVERYTHING and leaves a warming scent that makes my home comfy. I’d love to try the laundry soap! Thank you for the podcast. So interesting how thieves can help us become more earth friendly and make our homes healthy. I love that you guys do this podcast! I’ve never tried Thieves for cleaning but trying out the household cleaner is on my list to try! OMG! I ❤️ Thieves everything! I use Thieves cleaner on everything! I ❤️ The laundry soap too. I am anxiously waiting for Thieves dish soap to come back in stock!! Can’t wait! Thank you so much for this podcast! So much great information. I didn’t realize that there was no requirement as to chemical warnings on our products. Wow…not surprising though. Thank you! My favorite oil has to be Lemon, I use it in my water every day! I can’t wait to try the thieves laundry soap, I have heard how wonderful it is. I use Thieves laundry detergent as a pre-wash stain remover. I pour a small amount into the cap, add a little water, and use an old toothbrush to gently rub it into the stain. Let it sit for 10-20 minutes before washing. I love these products and they truly are a better way to live a harsh chemical free lifestyle. Love the thieves cleaner – can’t wait to try the laundry detergent! I just signed up for Young Living and have started experimenting with the diffuser. Not sure where this going to take me but looking forward to all the possibilities and trying all the products. I absolutely LOVE Thieves essential oil blend!! It smells fantastic and works great. I’ve made a DIY thieves spray (10 drops thieves oil, 1/4 tsp Sea Salt and 3oz water) and I use it for anything from cleaning my kids hands to freshening the room. I can’t wait to the cleaner though, u just ordered some this week!! DIY Laundry detergent & dishwasher detergent are my favorites! I would love to try the Thieves Cleaner. I’m relatively new to Young Living and I am loving it so much! Love the Podcast! I use the Thieves laundry detergent and am loving it! When I wash my husband’s UPS uniforms (ew — dirty!) I add a capful of Thieves cleaner to give the detergent an extra boost. I am still fairly new to the Thieves All Purpose Cleaner, but I am oh so in love with it and can’t wait to try more DIY recipes! I love my Thieves Cleaner, and how my whole family can grab the spray bottle with no worries! ! I clean everything with it and there is no other cleaners in my home! I just washed my car tonight with it, it sparkling clean with no harmful chemicals! I love everything’s I can get my hands on. I love thieves cleaner which I use on everything. I also love thieves toothpaste, which my children love as well cause they have sensitive teeth. I love my thieves laundry detergent and use nothing else. I use my thieves veggie and fruit spray all the time each time I cook. I want the dishwaher detergent put has not been in stock. I would love to win. My plan is to switch all my cleaning supplies to thieves and YL based EO products in all areas of our home, and then they will be gifts for our children and their families so they can change over as well. But I need to start first to show them how well it works, ordering on my next order…can’t wait. I am looking forward to making a carpet spray with these products!! Thieves is a easy, safe, effective & amazing smelling product! For us, our dog, our grandchildren-we all deserve it! Very informative! I love making a Thieves scrub for my sink with baking soda & Thieves! I love Thieves!! I’m so glad we made the switch, it was easy to get my husband on board! I use my Thieves for everything from wiping down furniture and mopping the floor to using it in my diffuser. It is the best and smells great. I get so many compliments on how great it smells. The comments have given me more ideas for use. Thanks!! I love my Thieves cleaner. Best cleaning product i have ever used! I would love to win the household cleaner! Thank you for the opportunity to win such a generous prize! I like to make the scrub with Thieves Household Cleaner and baking soda. Great to have less toxins in my house! What an incredible and generous giveaway! ❤️ This company never ceases to amaze me and I could not be more proud to be a part of YL! My family loves the entire Thieves line !! ?? Love my thieves cleaner! I use a variety of oils. Lemon, orange and lavender are my favorites! Spray bottles w each! Can’t wait to try the thieves Laundry soap! I love the Lemon & Thieves oils. I love the Household cleaner! I haven’t tried the laundry detergent but I’m wanting to try that next. I have been so happy that Young Living products have enhanced my family’s lives. I will never go back to the the lifestyle we had! TY Gary and Mary. Absolutely love all of young living thieves products but my absolute favorite would have to be the cleaner. I use the clear thieves spray bottle I got 2 months ago, put a capful of cleaner in and fill the rest of the way with water and just spray away. I use it to quickly clean my floors, my counters, walls, my truck seats, the bathroom, inside my washer and dryer, the oven. It’s more like what don’t I use it for lol. And it smells so freaking good!!!! Thanks young living for making awesome products! I love to use the Thieves Cleaner! We use it to clean our home from floor to ceiling wall to wall. I really like that my 2 year old son can be in the room as well as my pets as I clean because I know its a wholesome product! I love my diy all purpose cleaner! I use water, vinegar, Thieves and Lemon EOs! Clean with producta that will help you instead of hurt you. Truly inspirational! I really do love everything thieves. My favorite is mixing baking soda with thieves cleaner and a drop of lemon and work it into any grimy surface to reveal a beautifully clean shine. I love YL! Thieves spray is my favorite cleaner. It got red pen out of my couch with easy. I’m looking forward to making the laundry soap a regular in my home. love using Thieves Cleaner all over my house! My fav is to use on my windows! No Streaks here!! I am a thieves die hard!! I always have at least three thieves toothpastes on the go – one in my bathroom (for obvious reasons), one in my bag, and a spare in my oils cabinet. I have actually replaced both my toothpaste AND deodorant with the thieves aromabright toothpaste – love it! I use the cleaner for all all my household needs, but haven’t tried the laundry detergent yet…. would love to! So far I’ve just been doing laundry with a little bit of liquid Castile soap with a few drops of thieves or purification – and of course the YL dryer balls! I want to try to use thieves cleaner in more ways. I use it in the kitchen right now. Love the face that it is safer to keep around especially with having two kids under 2 at the house. I haven’t tried the laundry soap yet but I LOVE the household cleaner! I would love to win this giveaway! I’m excited to have a harsh chemical free home for my babies to grow up in. I love thieves cleaner. I look forward to try the laundry soap. I’m very sensitive to scents and delight in the clarity of young living products. I am in LOVE with Thieves essential oil and I am excited to try the Theives cleaner and detergents…and all the Thieves products for the matter. Thank you for this great podcast!! I am a personal care assistant which means I am exposed to all different kinds of chemicals through the day, several times a day. I am wanting to get rid of harsh chemicals in my own home to help reduce the damage to my system. I can hardly wait to get my Thieves kit. I want to start using it all and throw away everything that I have been using in the past. I’m working on creating a harsh chemical free home with Thieves products. My friend uses Thieves at home and in her classroom. I would love to try it! I LOVE the Thieves Household Cleaner! One amazing Cleaner for everything!! I’d love to try the laundry soap. I love all the Thieves cleaning products!!! They are amazing! I’m a very new newbie. I’ve heard about the incredible uses of Thieves. Excited to try all the oils and products YL has to offer. I am in love with the Thieves household cleaner and thieves essential oil!! I can’t wait to start using Thieves laundry soap! I’ll never go back to harsh chemicals again!! I’d love to try the thieves cleaner to keep my home toxic chemical free for my six kids. We’re a messy family and need time clean often. I’d love to have a safe alternative to the harsh chemicals in regular cleaners. I love the Thieves Household Cleaner. It is literally a miracle in a bottle. It cleans anything and everything. I have it in every room of my house. Just love it!! Looking forward to trying the laundry soap. I add a few drops of lemon to my theives cleaner. L❤️Ve the laundry soap! I already use the Thieves Household Cleaner. I want to try the Thieves Laundry Soap. I am super new to young living but thieves cleaner is definitely on my wish list. I would love to use a cleaner that doesn’t have harmful chemicals in it, especially having little ones. I’ve been enjoying using the Thieves Household Cleaner. What a great smell my home has after cleaning, rather than the harsh smells of toxic chemicals! Thieves is wonderful! Smells great and cleans everything. I used Thieves spray to get a Marksalot stain that leaked out on a church pew. I let it sit for awhile and then wiped it with a damp cloth. It took the stain out. I love the scent of Thieves and that it is harsh chemical free. I love Thieves! I use the cleaner and laundry soap and use the oil when sick and to make my own foaming hand soap. Thieves is my go to cleaning blend. I am excited to try it in laundry soap. Can’t wait to see how well it cleans my familys clothing! I love thieves cleaner combo’d with lemon eo for the toilet to smell extra clean and look sparkly. A drop of Lemon Essential Oil to the sticky residue left over after taking off a label from a jar you want to reuse (I reuse baby food jars for DIY stuff) and then just rub it with your finger and wipe clean with a cloth! I love using Thieves oil, cleaner and toothpaste!!! I am excited to try the Thieves Laundry Soap. My son has horrible allergies and we cannot use any soap that smells good. I’m new to oils but looking forward to using my thieves to clean the bathroom, kitchen and floors to keep the harsh chemicals away from my kids and pets! I’d love to try the laundry soap. I can’t wait to try Thieves cleaners! My daughter is just 3 months old, and I am eager to switch to a more natural and safer method of cleaning! I love using lemon oil to get the sticky residue off! I am excited to mix up a batch of the stain stick I saw on the YL blog the other day! I love Thieves!!! I love the thieves cleaner with a few drops of lemon for my wood laminate floors! Amazing promo! We use Thieves cleaning spray for everything! I have gotten rid of all pretty cleaners. I just recently made the switch and so far I am loving it!! Love the theives cleaner mixed with baking soda for a diy soft scrub! I love the thieves cleaner! Lemon & pine are also my favorite! I make my own softscrub with thieves, baking soda, lemon & orange!! Love thieves and am currently in the process of switching to all naturally derived cleaners in the house! “Starting Them Young” – One of our best friends have just become new parents and I would love to gift them this Thieves household cleaning package. What better time to start them on a harsh chemical-free, fresh and Young Living start? Thank you for this podcast ! I’ve switched all my multi/purpose cleaners, dish soap and dishwasher soap. I would be thrilled to try any Thieves related products as I’ve never tried any. Thank you for this opportunity! Would love to try the Thieves cleaner!! Trying to rid home of all the harsh chemicals but it’s a slow process, as money is tight. Everything I have tried in the premier starter kit has been awesome. Really enjoying the podcasts. Thanks! I love the baking soda, thieves cleaner and water combo. Works wonders on my shower stall. I use the thieves cleaner diluted for cleaning my entire house, and it works great on mirrors too! You have given me a few things to things to think about, as I need to need to make some major lifestyle changes due to my health. I love that Young Living is taking over my house! Making my home harsh chemical free! Thanks YL! I love all of the theives line but I LOVE the thieves concentrated cleaner! The laundry soap is amazing too! My first PSK came in the mail yesterday and I’m so excited!!! Helps get through those little bumps and dips in the road of life. I love the thrives product line!!! With 4 little ones I can give them a spray bottle with thrives cleaner and let them go to town. I am going to have to try and make the wipes using thieves cleaner. I can’t wait to try the Thieves Laundry soap and replace all other cleaners in my house. Love Thieves cleaner! Use it to clean everything and it smells soooo good! I love thieves cleaner for laundry spots, carpet spots, and all over household cleaning!!! Thieves…. I use it daily, in one way or another! Thieves toothpaste, thieves oil, thieves fruit and veggie wash… I ❤️ Thieves! I was just introduced to young living and thieves is at the top of my wish list(and many more) so this would be a great prize! I love making a homemade soft scrub with baking soda, thieves household cleaner, and lemon oil. I want to try the Thieves cleaner! Right now I make a cleaner with vinegar, water, lemon juice and Thieves oil! Thank you so much for the information. We love the thieves products, they are amazing! We are looking forward to using the thieves laundry soap. This is the only cleaner i am comfortable using around my kids! I love Thieves cleaner. I clean with it, add to my laundry, made DIY window cleaner and my husband thought I had opened the window after I cleaned it. He asked where the streaks were..lol. I love Thieves essential oil. And I just received my Dish washing liquid. Can’t wait to try it all. Would love to see what the household cleaner does to soap scum. I use Thieves cleaner in my home and in my first grade classroom! I LOVE it and always gets compliments on how well it works and how amazing it smells 🙂 I also use Thieves laundry soap! I love all the Thieves!! I love Thieves Household cleaner! It is what I use on all surfaces in my home and I know what I am using is safe, easy, and cost effective!! I need to get Thieves laundry soap, can’t wait to try it! I love my thieves cleaner and the versatility of it. I use it for everything in my home!!! We recently tried the Thieves laundry soap and cannot wait to get more!!! I run out often because I share so much!!! I love the line of thieves products, I have been able to replace a lot of my products with the thieves line and I feel great using less harsh chemicals in my household. I have never used the Thieves Laundry Soap and would be extremely excited to try it! Absolutely love the Thieves Household Cleaner and so does my mother-in-law who uses it for everything in her house! Thieves… there is no comparison! I’ve made a diy furniture dusting spray with water, castile soap,carrier oil,and lemon and cedar wood oil. I hope I win I’d love to try these products! I love using Thieves Household Cleaner for anything I can in our home! Thieves essential oil blend is what got me started with Young Living. I have since fallen in love with the selection of oils and oil infused products that YL has to offer me and my family and fellow oily friends! Thieves is our favorite!! Since trying it I made it my mission to rid our home of toxic chemicals. Now we can’t live without it. Thieves cleaner is my absolute favorite! I have successfully replaced all of my house hold cleaners with just this one bottle. Absolutely amazing!! I absolutely love Young Living oils!!! I can’t wait to start cleaning my house harsh chemical free. Thank you for the podcast. I definitely learned a lot!! I am most excited about trying the laundry soap. I use the Thieves cleaner for my house and my clothes also need the love of Theives!! Love Thieves and would love to try the laundry soap! I am loving my switch to Thieves Cleaner in my home. The mold that used to grow back bi weekly is not coming back! I can breathe in the bathroom after using thieves, couldn’t with bleach without getting an instant headache. Super excited! I feel much safer using Thieves Cleaner in my home with my small grandbaby getting more mobile and teething on things. I had such an amazing result on my bathroom mold that I switch all my household staples to Thieves! I’ve been wanting to try the laundry soap! I already use the concentrate cleaner for just abaout everything! I had no idea that there were no federal regulations requiring testing on cleaning products! I’m looking forward to getting rid of all harsh chemical products in my home and can’t wait to try the Thieves line. I have just started using Thieves Laundry Detergent and Thieves Cleaner. I truly want to remove harsh chemicals from my home and my family. I am learning everyday the benefits of using Thieves Cleaner and Thieves Essential Oil in my daily routines for all the supports they provide. I love Thieves HH cleaner. I have all things thieves except the dishwasher detergent so I’m excited for this to become available again. I love the Thieves Household Cleaner as a pretreatment for stained laundry. It’s THE BEST for cloth diapers. I just rinse well, spray, scrub and then leave in a bucket with whit vinegar, lemon and purification until I’m ready to wash. Works like a charm at removing stains and odors! I want to try the basic household cleaner. What I’m currently using seems to leave a residue and I find myself cleaning the cleaner. (Who has time for that?!?) plus Thieves smells pretty good. 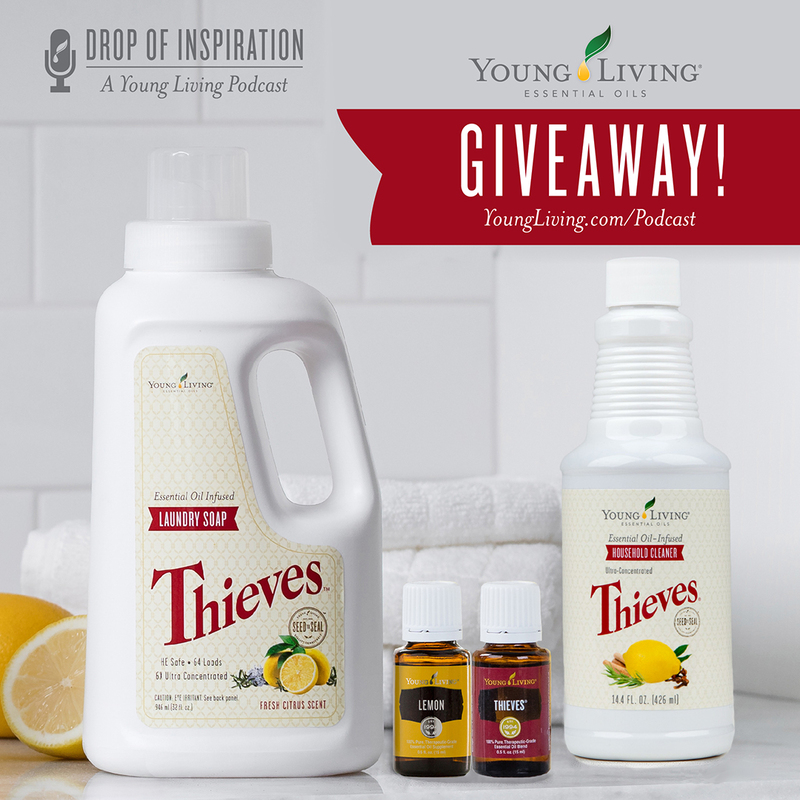 I am very new to YL and I only have a couple of oils but I have never tried thieves. I am wondering about it though and would love the chance to try it out. The main oil I use now is Peppermint. I have worked hard to make my home harsh chemical free. During that process essential oils have become a huge part of my daily life. I love to add citrus oils to my homemade cleaners. I have not yet tried thieves but I am excited to try the Thieves Laundry Soap. I love Thieves cleaner & EO! I use it all the time throughout the house. I use Thieves Cleaner to clean my grandsons toys and high chair! Love it! I love thieves cleaner! I use it for everything from toilets to dog nose smeared patio windows! Thieves is the product that sold me out for young living! I had no idea about essential oils or the benefits, but after using the hand soap at a friend’s house (who is now my upline), I was curious. The best decision I could have made regarding our household was switching to Young Living products. I’m slowly phasing out all the harsh chemicals and replacing them with YL. I can’t wait to try every cleaning and household product from the Thieves line! Love thieves! I’ve yet to try any of the cleaning products but it’s on my list for my next order. Thanks for the awesome podcast and giveaway! I love using my Young Living Laundry Soap and Thieves cleaner ! The soap cleans so well and last forever and so does the Thieves cleaner, and I love the fact that they are all naturally derived and plant based! I am a lover of Young Living essential oils. I’ve been using them for a little over two years, and I can honestly say they have changed my life for the better! I would love to try these amazing Thieves products!! Thank you for the opportunity to win! Love all of them but I haven’t used the laundry soap yet. I make my own softner woth epsom salt, baking soda, and a few dops of thieves- my clothes smell awesome and so does my washing machine. I would love to try the thieves laundry detergent if chosen. Thank you for all you do. I am new to oils, so I have yet to try these goodies. I am a teacher so anything to help keep stuff clean and keep the kiddos away from harsh chemicals in sanitizer, hand soap and bleach would make my heart happy. I can’t wait to try the dishwasher detergent! Thieves is amazing. I can’t wait to try the laundry detergent. I love thieves!!! I especially love how the soap scum disappears!! sign me up. I’ve already started using the thieves oil in my kit. But I would love the other thieves product About to have a baby in July and would love to have the smallest amount of harsh chemicals. Okay, I was a bit skeptical about the laundry soap. I need to be able to tell people about the products so I decided to try it. I WAS AMAZED!!! We had a high efficiency front load washer. My husband has to go into factories and sometimes his clothes come out greasy and full of grime. I put tick marks along the side of the bottle. I put a little in and washed our clothes. I only rewashed two pair of pants (my husbands!). LOVE IT!!! I can’t wait to try any of them how exciting!! I use Thieves cleaner on everywhere! ❤ Ready to try Thieves laundry detergent! I used Thieves Household Cleaner for the first time a couple of weeks ago & was so impressed. It even worked great on my bathroom mirrors! Now I may have to clean more (Shh!! Don’t tell my husband) ? Thieves Thieves Thieves!!! I made dish soap with the all purpose cleaner today! I am so in LOVE with the endless possibilities and uses of thieves. I need more in my life!!! I use diluted Thieves cleaner in every laundry was cycle and every time I run the dishwasher! Also fantastic for cleaning carpet! You can’t beat lemon oil for stains and removing sticky residue! I love the way thieves cleans r with some citrus and purification makes my house smell. I want to try the laundry detergent, and continue to make new cleaning concoctions with thieves cleaner and the oils! I love all things Thieves and Lemon! the household cleaner is the bomb! and sooooo cost effective! Thank you Gary Young for pursuing the Thieves legend and subsequent recipe. We appreciate it more than you will ever know! I love the household cleaner and I’d love to try laundry soap!! Love my Thieves cleaner!!!! So amazed by how much stuff it actually replaces! I love the thieves products! I would love to try the thieves laundry soap! I haven’t tried the Thieves laundry detergent & would really love to! I am excited to try the Thieves all purpose cleaner. I’ve been dying to try the thieves household cleaner and laundry soup. I currently put a few drops in of thieves and purification when I do the laundry and I love the fresh smell! I simply ADOREEEE all things Thieves!! Smells like Christmas ina bottle and just puts me in a jolly mood! I feel like a rockstar wife and mama for trying to keep our home as harsh chemical free as possible! I want them to have the best! I have NOT yet tried the laundry detergent. That would be nice to try! Can’t wait to try the Thieves laundry soap! Thieves Household Cleaner is amazing…I’ll never use another cleaner again…smells great, works great and it’s healthy for my family…Win Win Win! A couple drops of your favorite EO in the toilet paper tube helps keep the bathroom smelling fresh! I would love to win the Thieves cleaner. I am attempting to switch over to a non harsh chemical home to support my healthy living efforts. New to oils and would love to try and make the switch to some healthier cleaning. I’m excited to share the household cleaner with my mom. She’s not supposed to be around harsh chemicals and after using it to deep clean my new condo I know it will meet up to her standards as well as keep her healthy. I love using the thieves cleaner everywhere. It’s my first go to for anything. I seem to always find new ways to use my Thieves Clearner. My go to is my DIY cloth cleaning wipes. Mix all together in a plastic shoe box. They left over solution I pour into a spray bottle for mirrors, windows, toilet , shower and grill. They usually last me 7-10 days. I literally clean everything with them. Everything from cleaning the kitchen to detailing the car. I make a paste with the solution with baking soda to clean the shower and oven. I use a cap full in the bleach dispenser for medium to heavily soiled clothes, towels, sheets and rags. That a small spray bottle 1/4 thieves cleaner to 3/4 water to pretreat stains on clothes. I’ve used it to wash the dog when he decided to roll in black dirt from the garden. 2 capful to a 1/3 tub. I can clean anything with just 4 things: Thieves Cleaner, vinegar, baking soda and steel wool scouring pad. I have so much room under the kitchen sink now. Thieves is my absolute FAVORITE essential oil!!! I made a Soft Scrub with Thieves and lemon essential oil!! It is AMAZING!!!! I haven’t had a chance to use the Thieves Laundy soap yet but I’m hoping to be able to order it in the next couple months! Thieves household cleaner is my FAVORITE! I would love to try the laundry soap and everything else in the theives line! Thieves cleaner! Want to try the laundry soap for sure!! I would LOVE to try the laundry soap. I have such sensitive skin and have not found a grocery store laundry soap that cleans effectively AND won’t irritate my skin. Fingers crossed this will do the trick! Thieves is my absolute FAVORITE essential oil!!! I made a Soft Scrub with Thieves and lemon essential oil!! It is AMAZING!!!!??? Thanks for the giveaway opportunity!!!! My first bottle of Thieves cleaner is on its way right now and I’m so excited to try it out…everywhere!! Particularly my bathrooms and kitchen where I feel it’s the hardest to get away from commercial, gross products. Can’t wait to use it and get more harmful chemicals OUT of my home! We absolutely love the Thieves cleaner and the Thieves Laundry soap at out house! I like that I can have one cleaner for my entire house. I just started using thieves laundry soap and really happy with the change. It’s nice to know that everything my family is wearing is not carrying loads of harsh chemicals. I would LOVE to try the Thieves Laundry Soap!!! Its been on my wishlist since it came out. I love Thieves Cleaner & how versatile it is! I even use it to bathe my pets to control pests. I use all of these and love all of them! The laundry soap is gentle and yet effective. And the Thieves household cleaner rocks my world! I don’t know what I did before Thieves! I love all the Thieves products. They have supported my family’s health. I just wish I could afford to use them all the time. I use thieves cleaner for every surface in my home! ? Yeah! I love Thieves, and I’ve been dying to try the laundry soap! I want to try the thieves household cleaner!! I have been switching out the harsh products in my home for Young Living Thieves cleaner and oil infused solutions. I have not “pulled the trigger” on purchasing the Thieves Laundry Detergent yet because the “99% biodegradable and plant based solution” works well and I’m nervous if I will like it as much. BUT I want to try all of Young Livings products so I can clearly convey my love for this company and my belief in getting the crud outta our homes and bodies. So, I would love to chance to try the Thieves Laundry Detergent. Thank you. I love the Thieves Essential oil and lemon oil but really fell in love with the Thieves cleaner. Not only does it do an amazing job cleaning but it smells wonderful and o can rest easy knowing it is harsh chemical and toxin free’. I have yet to try the Thieves detergent but would LOVE too! Thanks for the podcast! I’d love to try the laundry soap and a do it yourself recipe for tubs and toilets. Thieves oil is 1st product that i purchased and now i totally fall in ❤️ this thieves by young living… Use it to clean and use Thieves Vitality to support the wellness of my family… Loved the herb smell in thieves…. Thanks young living for given us the great quality products.. ??? Appreciate all things ‘Thieves’, continue to use the products on a daily basis…cleans well & smells great! I love Thieves, is use the oil everyday. I use the cleaner for my counters. I love the way it smells and cleans. I also use the laundry detergent, I love using all naturally derived items when I can. I have been transitioning my laundry and cleaning supplies. My next project will be to classes clean our carpets. So excited and love the versatility of thieves products. I LOVE the thieves cleaner. I would LOVE to start using the laundry detergent! Thank you for the giveaway! Super generous package! I can’t wait to try thieves laundry soap! I am very ocd about cleaning, now that I’ve started using thieves cleaner and all things I can make with it it’s changed our lifes. Ditched all the toxic chemicals in our home. I’m loving every thing about thieves..
My friends and I swear by Young Living and Thieves! I just can’t keep enough around! Thieves cleaner all around the house!! I love that it is safe for my son to use and help me keep the house clean!! I’ve been using the Thieves cleaner on everything! I use Thieves Vitality oil when brushing my teeth and have the tooth paste in my ER order. I love the hand soap. I now want to try the dish soap. My next purchase is the thieves cleaner! I am so excited to try it out on so many different things! I love the entire Thieves line. I’m out of my Thieves Dish Soap now and am so very sad!!! I started with the thieves cleaner and have progressed to using the whole line! In addition to using thieves cleaner as a grout scrub (with added baking soda), my favorite use is with vinegar in a spray bottle to eliminate strong pet odors. I just stated using oils about a month ago. I am almost out of my starter kit, I use them for everything! I use the thieves oil to clean my dish sponge, on my forehead to support wellness, and I can’t wait to try the cleaning products. So many uses and all safe for my animals! Love all the Thieves products! Slowly “ditching and switching “. Love that these products are supporting our health instead of increasing our exposure to harsh chemicals. I LOVE all things Thieves!!! I cannot wait to try the Hand Soap and the Foaming Soap!!! Seriously, all the Thieves – get into my home!!! Love these products so much! Thanks for helping my family be healthier! I am new to oils and in the process of switching and throwing out all the harsh chemicals in my house. I was waiting for the Laundry soap to be back in stock to buy. Also getting my mother on board, which is awesome. I am really wanting to try thieves dish soap. I don’t use our dishwasher and wash all dishes by hand. I am hesitant to try it because it’s quite expensive by oz. And I feel as if I will run out quickly. I just received my starter kit 2 weeks ago and can’t wait to learn more about the products. I would love to switch over to this! I’ve been using the laundry detergent for the last few weeks and it is amazing! Would love to try the dishwashing liquid too! Thanks for the opportunity to win some amazing products! I love to add 4 capfuls of Thieves Cleaner to a 32 oz spray bottle and use as my stain spray for my clothes! I haven’t use the thieves laundry detergent and look forward to that. I love to put purification in my washing machine as well. I love Thieves Household Cleaner, I use it for everything!! Windows, floors, toilets, sinks, counters, I even have some diluted in a roller ball for laundry stains. I don’t have any other cleaners in the house other than the Thieves Household cleaner! I LOVE THC!! I’m slowly replacing the harsh chemicals in my home. I love Thieves Household Cleaner and use it in my kitchen and bathrooms, it is awesome. Thieves Laundry Detergent is on my wish list. I have heard so many wonderful things about the detergent and I can’t wait to try it. OM goodness, I love and use all these products !!! I can’t wait to try this cleaner! Have heard so much about it! I would be so blessed to receive these products! I just started with Young Living a month ago. I would love to try the Thieves cleaner line. Totally trying to kick all the toxins out of my house right now. It’s definitely a process! Great podcast! Love to know that I’m cleaning smarter, not harder. Products are great! Thieves Cleaner is my absolute favorite YL product! It makes cleaning my house a breeze and I’m addicted to the scent. Love love love!! I would love to get all of the dangerous cleaning chemicals out of my house! Fingers crossed I get picked! Interested in trying the laundry detergent. Im excited to try the theives household cleaner! So tired of using caustic chemicals, especially now being pregnant! I use thieves as a perfume. I use it in my diffuser. I use the cleaner in the kitchen. I love the toothpaste and how it makes my teeth feel. The hand sanitizer works well and smells nice. I’m excited to keep trying new products until I have them all!! I have been wanting to try the thieves cleaners for a couple of months as we’ve recently moved into a new (to us) home. Now that we’re settled I’m ready to give it a try. I love my thieves EO and cannot wait to try the cleaners! I use thieves oil every day! I have yet to try the thieves cleaner and laundry detergent but I’ve heard so many great things! I am slowly but surely turning my home into a harsh chemical free home. Thank you for the giveaway and hope everyone has a great weekend! I LOVE all the Thieves products, especially the Cleaner. It gets my home so clean and is so safe to use, plus it saves me lots of money!!! I haven’t tried any of these products but would absolutely love to try them!!! I love thieves!!!!! Would love to try householder cleaners! I tried Thives cleaner and i am excited to try and the laundary soap. Great products! How to mix up a spray bottle of thieves cleaner for cleaning out his rabbit’s pen. I’m so thankful to have something safe him to use all on his own. Oh my goodness thieves laundry detergent would be amazing !!!!!! Love essential oils! The cleaner is great, and the lemon oil smells awesome! Haven’t used the detergent, but would love to win and try it out! Love the thieves cleaner for everything and used a half a bottle of lemon eo just this evening removing sticky stuff from my husband’s new old truck! I am new to Young Living and am enjoying my oily journey thus far. I am eager to try all the Thieves cleaning products to make my home healthier and cleaner. Love the fact that I can use these priducts without the harmful and harsh chemicals. Thank you Young Living. I love the Thieves Household cleaner & EO. So looking forward to trying the laundry detergent!! Love all things Thieves and very much enjoyed this Drop of Inspiration. I used my Thieves cleaner today to clean up dog mess, I was floored at how well it completely got the stain out of my carpet. And I love❤️ love❤️ love❤️ love❤️ that my babies and my fur babies can be all over it and I don’t have to worry about what’s going into their bodies. Thank you Young Living! I love thieves oil and cleaner. I use the cleaner for all counter tops, sinks, tubs and mopping my floors. This month will be ordering detergent and continue each month making healthy changes to kick those nasty chemicals out of my home. I love the stain stick that was just on the blog a couple weeks ago! I used it to get a spaghetti sauce stain out of my new white tee! Phew! I use Thieves Laundry soap. I put Lavendar or Orange on my dryer balls in place of dryer sheets! I have never used Thieves products, but like to try them. I love the Thieves cleaning products! We love the laundry soap because it doesn’t bother my husband’s skin. I am beyond happy with my starter kit. Would love to try the cleaners,too. The quality that goes into ” The seed to seal” promise of Young Living is something no other company can make. So grateful my daughter introduced me to them! I use theives cleaner. 1 cap of theives cleaner and the rest is water! My tip is if you need a little pick me up use some lemon in your diffuser!!! I’m new to all this and would love to try it and possibly become a distributor! Love essential oils and all naturally derived products! I would love to win this and start to get my house chemical free. I love the smell of Thieves. I’m new to YL and need lots of help making the change. Any of them would be amazing!!! I use thieves household cleaner and I mix it with Vinegar as well as water to give it a little extra cleaning boost! I love the smell and I am shocked at how harsh and nauseating harsh chemical cleaners smell to me now! I aspire to switch out ALL my cleaning products, and would love a little extra help in doing so! Way to go Young Living on helping folks learn a better, cleaner & healthier way of living! Would be great to try the household cleaner. Already use the laundry detergent. I’ve just started using Young Living essential oils and I’m excited to try Thieves Household Cleaner to disinfect my classroom this year. I use thieves for my floors. Love the way my house smells when I’m done cleanng.. I love everything THIEVES! My favorite is the thieves spray. Just add a capful into spray bottle and top it off with water. That’s it! Occasionally, I’ll add a couple drops of citrus fresh. This thieves cleaner is the only thing that cleaned my blinds. The previous renters left them, dirty, yellowed & sticky. I sprayed the blinds & wiped all of the grime off easily! Love the podcast! I have switched out harsh chemical cleaners in our home with Thieves Household Cleaner and love the results! YLEO’s on dryer balls instead of dryer sheets, homemade deodorant, bodywash and diffusing YLEO’s keeps the house and our emotions happy and productive! I love thieves cleaner. Makes my house smell amazing! Just a couple of nights ago, I was going to turn on my dishwasher before I went to bed…and I found that I was out of dishwasher detergent! I was pretty upset…until I realized that I had everything needed to make my own detergent. Baking soda, Borax, citric acid, and lemon and Thieves essential oils. 5 minutes and I had made my own detergent, which worked beautifully, by the way! I will never by dishwasher detergent again! And Thieves Cleaner I use for floors, countertops, mirrors, stovetop, dog crates! The list is endless! So thankful to have been introduced to YL and the Thieves line of products!! I absolutely love my thieves!! I can’t live without it!! It’s a must have for everything you clean in your home and around the house. And vehicles!! Naturally derived and don’t have to worry about my kids around it??? I can’t wait to try the laundry soap! I LOVE the Thieves HHC, it smells SO Ah-mazing! When I get my laundry soap, the first DIY I’m making is the stain stick! I would really like to try the cleaner! I love thieves! I want to try the dishwasher soap! I just started using both the Thieves Laundry Detergent and Thieves Household cleaner and it has made an incredible difference in my everyday life! Its so much fun to clean using these products and I love that they are harsh chemical free, smell AMAZING and work better than anything I’ve ever seen! I mixed undiluted Household Thieves Cleaner with baking soda and a few drops of lemon EO the other day and applied to a super rust-stained bathtub and it looks brand new! I love the laundry detergent! seems to really get my clothes clean and only takes a tiny bit! Love this stuff! Can’t wait to convert my home to harsh chemical free! Love the thieves cleaner ? I totally want/need to start using this. I have a same ole from some friends and it worked amazing. Hope to win! I love the drops of inspiration that get shared. Every drop is valuable and sparks even more excitement! The Thieves line is a favorite for me and many of my friends. I haven’t tried the laundry detergent yet and I would love to!! My sister introduced me to essential oils and I am so excited to incorporate them more into my families life. I love diffusing Thieves and can’t wait to try the laundry and cleaning products! I am new to essential oils and am so excited to get my Thieves cleaning kit in the mail any day now. We are so ready. I love Thieves laundry soap with some lemon essential oil! Gets my clothes so clean without harsh chemicals. I love all things Thieves. I used them with my son and it’s important to keep things really clean since he is also OCD! I love the smell of the thieves, too. I am almost a year into essential oils and I have yet to try the cleaner. I still can’t get my husband on board no matter what so it’s hard to change things up on him when he swears by the cleaning supplies that he likes. (He is the one that cleans the house). We have two little ones so I would love to switch. My kids and myself absolutely love the smell of the thieves oil and they don’t like to go a day without it in their “volcano” diffuser. I can’t wait to try it and look forward to trying everything young living. Love the Thieves products! So fresh and clean smelling! I have replaced all my old cleaners with thieves household cleaner and essential oils! I love all things thieves!!! Thanks young living for all the great products you share with the world! Love Thieves everything! But the simplest thing that makes me the happiest is just cleaning my kitchen table with Thieves cleaner in the beautiful glass bottle. And not using the toxic anti – bacterial wipes I used for years. Love my Thieves cleaner! Safe for my family and home. I would love to try the laundry soap! Thieves galore at our home. I use thieves to clean nearly everything in our home. I have the cleaner and the oils. What I do not have is the dish soap. That is what I want to get. I have put Thieves Cleaner (2 capfuls) in the bottom of my dishwasher and ran the dishwasher. It did a great job. I would love to try the Thieves cleaner. Currently I’ve been using Lemon oil and vinegar to clean my whole house which works very well. I can’t wait to the cleaning my floors with Thieves! I’m new to the oily life!!! But I’m crossing my fingers to win, I reeeeeally want to try out that household cleaner!!!! Gonna try the DIY bleach tomorrow? I’m fairly new to YL, but one of my first purchases was Thieves cleaner. I can’t say enough good things about it, it’s that amazing! I’ve used it in my wash, in my shower, carpet cleaner, used it when I made dishwasher detergent, on my counters and floors. I love it!!!! ???? I love Thieves Cleaner! It’s smells like Christmas. I LOVE the Thieves products and they are absolutely amazing!!! I use Thieves Household Cleaner on everything. Would love to try Thieves Laundry Soap and Thieves Dishwasher soap. I absolutely love Thieves cleaner!❤❤❤ I have totally switched from using harsh chemicals in my household to all thieves products from toothpaste, laundry, dishwasher, dish soap and of course the Household cleaner! If it wasn’t for young living, I would still be ingesting all of the harsh and cancerous chemicals! I have turned so many people on to THIEVES cleaner! I’ve gotten so many stains out of carpet, my couch and it also left my bathtub SPARKLING?? I really want to try the Thieves Laundry Soap. I love to use Young Living Lemon oil when doing laundry. A few drops of Lemon on my clothes and the stains are gone. So much better than using smelly chemicals. I’m a mother of four from Malaysia and my heart is to raise healthy, powerful children that will not only impact their families in the future, but their communities too. I believe that it begins with ME. I will help them, guide them and empower them to live a toxic chemical-free lifestyle using these amazing products that Young Living brings to our homes! We love all the Thieves products, they are a must have in our home. Ditch and switch!! I had a salesmen come to our home trying to sell me his supposed all purpose chemical free product, I quickly turned the conversation to our awesome products. It was fun!! I love the Thieves cleaner and laundry detergent. We replaced everything with these and the added bonus is that it smells so good, sometimes we just grab the bottle we have diluted with water for cleaning and walk around and just use it as a room spray to spruce up the house! When you finish cleaning, it just smells like you’ve been running the diffuser at home. ? The dish detergent is wonderful as well!! Thieves cleaning products changed how I clean everything in my house! Just a little goes a long way. I love the way it smells! I love using Lemon to get stickers off the floor! Thieves house hold cleaner and a little baking soda are so great on your sinks! I absolutely love how i have replaced EVERY household cleaner with thieves products!! Under my sink is so tidy now and not all cluttered with a million different solutions… best part is that now that i switched to thieves cleaner i no longer get headaches or dry irritated skin from the chemicals after im finished cleaning my house.. i love the smell of thieves and it has tackled every one of my cleaning needs so far!! I love Thieves anything!! I clean houses and use Thieves Household Cleaner all the time. For a gentle scrub I use 1/2 cup baking soda, 1 capful of Thieves Household Cleaner, and a few drops of Lemon Essential Oil. I love the Thieves Laundry Detergent too. Can’t wait to make the DIY Stain Stick! I started started using Thieves household cleaner and LOVE it. I tell everyone about it. I want to try the dish soap and laundry detergent SSSSOOOOOOOOO bad. I am excited to have a chance/opportunity to try the laundry detergent! I keep reading rave reviews. I have a nickel allergy and am trying to get away from many of the cleaning products that are on the market. Thieves doesn’t irritate my skin and leaves everything clean and smelling fresh. Would love to have my hands on the cleaning products. I just received my premium starter kit today! I would LOVE the opportunity to use thieves in my home! I’ve heard and read so many wonderful things about thieves! Love thieves! I just got my first bottle, would love to have another!! I love Thieves Cleaner! It’s safe for the kids when they want to help clean! I was blown away by how amazing thieves cleaner is!!! The products keep blowing me away!! I would be so excited to try the thieves laundry detergent! Thank you so much for your wonderful products! The entire Thieves line is a staple in my home. I love that I can feel good about the products I’m using and not have to be concerned with exposing my family to all the yucky stuff found in other common household. Products. I just completed a learning group on Facebook and I am so inspired to really “clean” up my cleaning! I am throwing away all my harsh chemical cleaners and looking for eo ways to keep the house fresh and clean. I have got some glass spray bottles ready for some eo cleaning recipes! I love Thieves oil and the household cleaner!! I use them daily!! I works love to try the laundry detergent as I’m the only woman in a house full of men/boys! My whole family loves YL!! Right now I only have the Thieves cleaner and hand purifier and I don’t think I could live without them any more!! I love the feeling of knowing my son can touch the bottles without me worrying about having to call poison control! I’ve been really wanting to try the hand soap and laundry detergent so I can work more towards getting all harsh chemicals out of our house. I am just new to using Theives, we just bought a new house and the previous owner left us a bottle. I like the way it cleaned the blinds. It took the dirt right off them. I am excited to try the laundry cleaner. I am just starting with essential oils. I am really enjoying diffusing the peppermint oil. I like to say Thieves as a cleaner for #allthethings was the gateway oil to our healthy journey. We use it in so many ways now in our wellness center and our home and love teaching others to do the same! A DIY homemade household cleaners book got me started with using Thieves essential oil blend which could be easily found from Young Living. I use Thieves Household Cleaner for EVERYTHING! I’m a mom of three littles and I love the simplicity of just needing one cleaner, plus I feel 100% safe using it around my kiddos. In fact, I believe because of my daily use, it has helped to keep our immune systems strong! I also LOVE the laundry soap! I use it as a pre-treatment as well! I am excited to try Thieves cleaning products. Just recently I have started expanding my base on essential oils and making my own cleaners or purchasing them through Young Living. I absolutely love the lemon for diffusing in tbe air to help freshen it and for adding to my essential oil recipes. I love how clean and fresh the Thieves Cleaner makes everything! I’ve been needing to try this cleaner! I absolutely love thieves in the diffuser!! My granddaughter has some Thieves and it smell so clean. Nice giveaway. The smell of Thieves in my new house… Yeah, Its like that! Today I used Thieves to clean my kitchen windows, I just needed to see how well it would work. I loved the end results, and my house smelled so good. Thieves Laundry Soap is next! Looking forward to trying the thieves laundry soap. I love diffusing lemon for a crisp clean home. I love the Thieves EO, so I’m curious about the cleaner! I love using thieves on feet and diffusing. I’m anxious to try thieves for cleaning. And eliminate some harsh chemicals in my home. Put me n for the drawing!!! I am still a bit unsure how well does this clean compared to the regular store products. We use Thieves in all forms!! I just learned to do “stationary diffusers”, especially in the bathroom. Thieves and orange are my favorites right now. I add a few drops to my beach treasures and the scent lasts!! I’d love to try Thieves laundry detergent. I love the smell and have been in the hunt for a good laundry detergent free of harsh additives. I have yet to have the extra money to splurge on this yet. I would love to try out your recipe for the diy stain stick! I use Lemon and Purification with my Thieves cleaner around the toilets. I have 2 boys, enough said. It really helps freshen up the bathroom, and I feel good knowing my kids aren’t exposed to harmful chemical cleaners. I’m excited to try these cleaners! We have made homemade wipes with paper towels, thieves all purpose cleaner, thieves oil and lemon. Thieves for every surface in my house! Love using Thieves cleaner to clean baby gear and furniture knowing that it is safe! Excited to try thieves laundry soap on cloth diapers! I can’t wait to get started removing the toxic cleaning supplies I have and replace them with Thieves cleaner and Thieves laundry detergent. I love my Thieves essential oils. I have not been able to try the cleaner yet, but would love to get rid of all of the toxic cleaners we currently use and switch to thieves for everything!!! I have a basket of clothes just waiting for stains to be removed by thieves!!! Thieves was my first YL product 5 years ago and it’s what brought me back to YL this year! I’ve made my own healthy cleaners in the past but trust the power of Thieves and love the scent! Would love to win more Thieves to share with friends to introduce them to a healthier home! I would love to get started with this cleaning line. My COPD Dr. recommended naturally derived cleaners such as this. I love all the thieves products!! I’m most excited to try the laundry soap. I think it’s the only one I haven’t used. I have yet to try any Thieves cleaning products but in the last couple of months I have been trying to switch all of our products (household and otherwise) to cleaner alternatives! I love to diffuse thieves for my daughter and I can’t wait to get a chance to see what else we can use it for in our house 🙂 this mama wants a nice, clean house without all the harsh chemicals. I love these products so much. I know they are products that my family and I can trust. I ❤ thieves oil! It’s one of my favorites! Wow! Young Living is so generous! I can’t wait to get on the path to a harsh chemical free household! Thieves cleaner was one of my very first outside the box purchases!! Best decision ever!!! I am new to yl. I love the thieves cleaner. I am using it for everything. Next time I am gonna add lemon to my kitchen cleaner once I get a glass spray bottle. Oh my goodness where do I start!?!?!?!? I became a member of Young Living July 2016. My daughters and I were in the middle of doing several consignment events we have been doing for 10 years. I didn’t have time to even think about my kit let alone start using oils I knew absolutely nothing about. I set up my Dew Drop diffuser and put Thieves oil in it. I was hooked. I didn’t do anything else for 6 weeks. I just Kept diffusing Thieves. I put some in the mop water, I made a spray bottle to use. I was in love with the oil itself. Then I got a FREE bottle of Thieves Household Cleaner. WOW… I have used that cleaner for everything under the sun!!!! It is amazing stuff to clean your floors, kitchen, bathroom, carpets, windows, grill, furniture, grease, laundry presoak, car, stain remover and the list goes on and on. In my home it is THIEVES FOR EVERYTHING !!!!!!! I am never out of anything Thieves! Thank you Young Living for the most amazing oils and products on the planet! I just started using the laundry detergent and I’m so happy with it. It’s concentrated and only takes 1/2 tbsp for most of my loads and smells amazing good. I love THHC because it has so many uses and I don’t have to worry about it affecting my family’s or pet’s health! I love lemon oil! From adding it to my water, to diffusing it for a fresh & clean scent, it’s one of my faves. I’ve never used the Thieves cleaner – I’d love to give it a try! Young living seriously sets the standard. This is one of the VERY BEST companies I have ever come across. Thank you Young Living. You have helped change my life and others around me. I absolutely love the Thieves line. I use the foaming hand soap, toothpaste, mouthwash, the household cleaner, and the spray. I use the spray to freshen up my floor rugs. I really want to try the laundry soap. Very happy with all things Thieves. I use thieves cleaner as a pre-wash stain remover! Just pour a little bit on the stain, soak for 10 minutes and throw in the wash. I really would love to try the thieves laundry soap and switch all of my cleaners over to the thieves line. I am new to oils, but am excited to try the household cleaner. I can’t use store bought, harsh cleaners. Thieves Cleaner has changed my life! I no longer need to worry about how I will feel after cleaning my bathrooms, kitchen, etc. I no longer have to use toxic chemicals (even the ‘organic’ ones)!!! I’m so grateful for this company and the opportunity to help others become educated and learn how to keep their lives in a more balanced place – bring full health and life to their families! I am so eager to try the thieves laundry detergent. I have such sensitive skin, but I am willing to try the laundry detergent. I love the thieves cleaner. Such a good value, and the natural scent is wonderful. I have been wanting the thieves line for almost 2 years now. We have a special needs son, so we are very careful which kinds of cleaning products we use. We use the YL essentials oils for everything!! There’s never the extra money at the end or beginning, of any month so we haven’t been able to take the full YL plunge yet. Good luck to everyone who enters!! ? Love learning all the ways Theives can keep my home clean. Im a fairly new distributor, and i truly enjoy learning about YL everyday. I make my own Thieves spray cleaner by adding a few drops to a non-toxic soap base. Keeps the house smelling fresh. Thanks for the opportunity to spread the wonder of oils! I Love all Young Living products! I just recently got the Thieves cleaner and I’m l9ving it!!! It cleans so well!! Love the clean smell of thieves! Love YL and Thieves. We clean with Thieves and love using the essential oil topically as well. I’m still new to all of this but I would love to try all these products. Specially non harsh chemicals. I’m using Thieves, Thieves mouth rinse, cleaner, laundry soap, and fruit and veggie spray on a regular basis and love reducing harmful chemicals in my home. Absolutely ♡ the Thieves Home Cleaning kit and am really excited to learn about and all the Thieves products such as laundry soap and dishes soap. I’m really excited to try to the thieves cleaner! My husband buys so many cleaners…filled with harsh chemicals! I want to try something that’s naturally derive and safe. I love using lemon vitality EO in my water. Tastes great and makes me want to drink more of it! I’ve also been using thieves EO in a roll on for immune support as I wok in health care. I fell in love with thieves cleaner months ago and finally threw away ALL my toxic chemicals I used to clean with!!! So liberating! I love the peace of mind as well when using the cleaner. Never have to worry about my family breathing toxic chemicals when I clean the house!! Thank you Young Living!! I aslso curriently have a few friends purchasing the cleaner now because I love it so much!! I am slowly weeding out all the harsh chemical cleaning products from my home and would love this set. I use thieves laundry detergent and love it. I take the oil with me everywhere. Would be awesome to win this to help. As a mother of 3 and a hubby who is away on active duty orders these products are super important to my families health. I love the laundry soap (well the whole thieves line actually) but with 3 young kiddos I need to stock up on it ? Thank you youngliving for making a safe, naturally derived, and effective product that I can use around the people who are the most important part of my life ? Thank you Young Living for all the help in all our lives! The Thieves line of products blows me away each day. I feel confident and assured when I’m using Thieves cleaner or soap or detergent, etc, that I’m using the best products out there for clean living. It’s a beautiful thing. I’m excited to try essential oils in cleaning as I’m very new to it! I got a small bottle of Thieves Cleaning product to try it out. I never realized all the ways you can use Thieves. I’d love the opportunity to win this give away. Through the last few years I’ve been a Young Living Essential Oils daily in my life and I love it! I’d love to try making the stain stick! I love using thieves cleaner and baking soda to make a paste for bathtub scum!! I’ve been wanting to try the laundry soap, but I’ve been a little hesitant since I do so much laundry. I’m a little afraid of how often I’d go through a bottle! I would absolutely LOVE to get rid of the harsh chemicals from our laundry. It’s the last area I have to do in our home. I just started YL and love my starter kit. I’ve heard so much about the thieves cleaner. I would love the chance to try it and continue to better my home! I’m so excited to use the thieves cleaner!! I just barely got it yesterday so I’m actually stoked to clean house tomorrow haha. I’m looking forward to kicking toxic chemicals to the curb on cleaner at a time. I have been waiting to try the thieves cleaner!! I’d love to win this bundle. It would be great to be able to have my almost 4year old help with cleaning & not worry about the chemicals! LOVE THIEVES. I have been trying to get switched over to a chemical free lifestyle, so this would be an awesome WIN. I’m excited to try the Thieves dish soap and dishwashing soap! I love the household cleaner and laundry soap! I have thieves cleaner on my list, I started in Dec of last year, so I’m trying to make the change to go harsh chemical free. Thank you for this opportunity, it’s great!!! God bless! I love the smell of Thieves – so use it a lot. Haven’t tried the laundry or dish products yet but would love to try them. Thanks for all you do to keep us healthy! I’m so excited to try the laundry detergent! I love love all these products!!! I use lemon EO everyday somewhere including adding it to my wash machine when washing whites! Removed ink stains from my brand new white top applied directly on stain, rubbed it in, washed, still faint, hung outside in sun. Voila ink stain gone. ? I recently ran out of laundry detergent so instead I used a capful of Thieves cleaner instead. It worked great! Next time I’ll probably use two capfuls, but it’s nice to know that I could get away with just one. I absolutely LOVE lemon and the Thieves cleaner and use them both everyday. I would REALLY like to try Thieves laundry detergent. I can’t wait to try Thieves in DIY dishwasher tablets! I am excited to try the thieves laundry soap. I was a thieves cleaner believer before, but the day it took black and blue cupcake frosting out of my carpet made me a supporter for life!!! Plus I can make my kids clean up their own messes! I am just starting with oils and will def be investing in Thieves eventually! I look forward to the cleaner because I hate using all those harsh chemicals esp around my 10 month son and they don’t even work that well! I would love to switch out my current cleaning products for Thieves. I am trying to transition my cleaning products so would love to win this!! The laundry soap is amazing! Fits in beautifully to our holistic practice where we work at decreasing the harsh chemicals we expose our pets to!! I LOVE Thieves laundry soap and the while Thieves line! Thieves Household Spray can do and clean anything! We use it at my school, as well as home! Have heard great things about Thieves, want to try tjem all! I love Thieves Household cleaner and want to try the laundry soap next! I’m slowing replacing all products to Thieves….Excited! I already use the Thieves household cleaner, So I would love to try the Laundry soap! I love Thieves EO, so am very curious about the Thieves Laundry Soap. I have used EOs for a few years, but am really getting into using them around the house now to reduce the amount of toxic and unsafe chemicals. This never mattered to me before, but now that I have a little one, I not only want to keep fewer dangerous household cleaners around for her sake, but for my husband’s and my own health…we want to stick around for a long time to see our sweet girl’s future! I love how the Thieves cleaner gets rid of my sticky grim with no residue..the best part is the smell..heavenly! I’m a school teacher who would love to be able to clean my room without the harsh chemicals. I’m also a mother trying to live a healthier lifestyle with less chemicals for my family. I love Thieves oil and can only imagine how amazing these products are! I would love to win this to try cleaning with it! Can we just say, life changing and amazing?!?! Thank you for this valuable information! I will never go back to the old, harsh chemical laden products I used to use. I am living my laundry detergent! only thing that seems to get the stench out of my hubs workout clothes and gentle and safe enough for the pesky spit up “stains” left by my little newbie!! LOVE my theives cleaner, I can’t wait to try the laundry soap. I have the hand sanitizer too and swear by it! I am slowly making the switch to all things Thieves and this would be a great way to get it done quicker! Love this podcast!! Can’t wait to try toilet spray! I also love using straight Thieves cleaner or lemon essential oil to clean marker and crayon “art” from my playroom walls. Works like a charm and I don’t have to worry about my kids touching the walls! So much cleaning, so little time! YL’s Thieves products make my home safer, cleaner and my chores so much easier, and dare I say enjoyable. I would really love to try the Thieves laundry soap! I love my Thieves oil and would love to try the laundry detergent. Looking forward to making my house a harsh chemical free zone. I switched everything in my home except the laundry soap. I really need to get on that. I love the Thieves products. I bought the cleaning kit after buying my PSK. I loved it so much that I bought the thieves essential rewards kit. I have made cleaning sprays and other DYIs. I’ve love the toothpaste and how it really makes my mouth/teeth feel clean. I love the smell of thieves, its many uses and its harsh chemical free. Thieves cleaner removes fireplace soot from glass. I am slowly replacing all harsh household chemicals in my home. It takes a while since I buy in bulk. I have been using the oil and cleaner. Laundry detergent is on the list to try in the near future! Great podcast! I love the laundry detergent and can hardly wait to try the dish soap! ?? I would really really like to win some of this goodness!!! ?? My favorite is being able to use Thieves cleaner to clean up a spill in the fridge, and not worrying about harsh chemicals getting on the food. I love using Thieves Cleaner and letting my kids help clean with it! I don’t have to worry about any harmful chemicals around them and it smells so good! I love thieves oil. It is a very calming scent, makes me feel healthier. ? Can’t wait to try the laundry soap! Thanks for the post! We use only the thieves cleaner in our house and have been so happy with it! From small spills to huge projects~it takes care of businesss!! I would love to try the Thieves Laundry soap. I love diffusing Thieves EO. Love to add lemon to the cleaner and laundry soap!! I love Thieves hand soap! The rest of the products are on my list to try. I’m a long time lover of YL oils, but have yet to try the other products avaliable. I’ve heard amazing things about all of the thieves household cleaners and would love to try them! I love Thieves products. I use it everyday and love the hand soap and toothpaste. I look forward to trying the laundry soap. I am new so thanks for all the podcast and blogs . I am learning so much! I love the Thieves Cleaner. I put it to the test when my son accidently spilled a lot of cold oil from the deep fryer all over himself and the floor. I just poured a little bit right out of the bottle and got my mop really wet. It cleaned it up with no residue and the floor was not slippery afterwards. I love my thieves cleaner!! I’d love to try the laundry soup also! Doing my best to convert my house to a harsh chemical free home. I’ve been using YL for about 6 months now and have been wanting to make the switch on my cleaning products. I’ve heard great things about my friends using thieves cleaners! Love using the thieves cleaner for EVERYTHING!!! Windows, floors….everywhere!!! I love adding Thieves and lemon essential oils to baking soda when I need extra scrubbing power cleaning the bathroom. I haven’t tried any of the thieves cleaning or laundry supplies but I would love to try them all. Im new to YL. ave not used a theives cleanet yet. Excited to try it! I absolutely love Thieves cleaners. ? I got into Young Living in 2016 of December and I’m so glad of the changes i have made for me and my family! I LOVE using thieves cleaner plus I add a little bit of orange oil to mine! Omg smells spook good!! I am looking forward to trying Thieves Laundry Detergent and Thieves Dish Soap. I love adding Citrus oils to items already in my pantry to create green cleaning solutions. I love Thieves Household Cleaner, EO, and toothpaste. I have been thinking of trying the other thieves products. My daughter gave me a small spray bottle of Thieves cleaner, all mixed and ready to use. I love it, especially for cleaning the bathroom (around the toilet!). Would love to try the laundry detergent. Love YL products! I use Thieves Laundry Soap and household cleaner. Love the smell but especially knowing that I am getting a really great clean every time I use them. I LOVE thieves household cleaner- I use it for everything! I also made the window cleaner and my windows have never been cleaner 🙂 I recently started using oils so I am still learning how to fully switch over! My absolute favorite is the Thieves household cleaner! I use it for so many different cleanups, messes and daily grime around the house, it’s just a natural win!! I am brand new to YL and have not bought any thieves cleaner yet. One of my up line gave me a sample, and wow I was amazed! It picked up stains from my WHITE kitchen counter. I love thieves so far. It cuts thru grease so well and smells great. We are working on becoming a harsh chemical free cleaner home. Thank you for all the great information and letting me know more about it. I love my thieves oil! One of my fav uses – I use several drops with a little vinegar to take the stink out of my washer!!! I’m so excited to try the Thieves cleaner!!! I am new to the essential oil scene but have heard wonderful things about Thieves and would love to try it. Thieves is at the top of my list! I was leaning up against my husband’s truck while he was working under the hood. I got grease on a brand new shirt that I had been wearing for an hour. Ruined, I thought. Nope. I put Thieves cleaner and a drop of lemon on it, soaked for a couple of minutes and the grease came right out. Thieves is my go to for our entire house. Kitchen, bathroom, and laundry. Love, love, love the Thieves cleaner! Someone gave me this tip and it is amazing… Use the Thieves Household Cleaner as rinse aid in your dishwasher! It compliments the Thieves dishwasher powder perfectly! I love thieves cleaner! I do in home child care and have a bottle in every room to clean with. I have never tried lemon or thieves oil for cleaning. Will have to try it! I love young living and can’t wait to try this cleaner and laundry soap! ? I love my on the go stain stick. I put 1/2 cap thieves cleaner in a 10ml roller bottle and top up with distilled water. I would love the Thieves Laundry Soap! I have never tried the Thieves laundry soap. Love the multi cleaner (use it everyday for countertops and bathroom clean ups). I am interested in trying the laundry soap. My husband likes a specific type of soap, but I want to reduce the harsh chemicals. If I git a bottle for free to “try” (wink, wink) he may be more apt to switching. Hope I am one of the winners! My fat fingers misspelled “likes” and “get” and “for.” My post is one hot mess of mistakes. Guess I was too excited to spellcheck! Oops! I love all things Thieves! I can’t wait to try the dish soap and make the toilet spray! I’m new to YL and I tried the thieves cleaner and love it!! Such a great harsh chemical free option!! Can’t wait to try the Thieves Household cleaner! I add a half cap of THC to my dishwasher and a capful to my washing machine! I love my Thieves Household Cleaner!!! Love Thieves everything! I like to use the Thieves soap as a spot remover before putting it in the wash with my Thieves laundry soap. Haven’t tried the dishwasher cleaner yet, but it’s on the list. We are slowly moving every product in our home to young living products. It makes me feel better to know safe ingredients are in their products! I have never used Thieves period but would absolutely love to!!!! I am very interested in making my home harsh chemical free! I LOVE all things Thieves!! I use my cleaner for everything and add to my homemade dishwasher tablets!! I also give my laundry soap an extra boost with it and add it to baking soda to easily get all the grime off my tub/shower!!! You can never have enough Thieves!!! I just recently started using the oils and diffuser for my son and myself and have been so happy with the results! I am looking forward to trying the laundry soap and cleaning products! Trying so hard to move into a happy holistic lifestyle! ? Over the last 3 years I have kicked most toxic chemical laden cleaning products to the curb. I love Thieves HHC is awesome and so economical. I’m still making my own laundry soap, and would love to try the Thieves Laundry Detergent. I am new to essential oils but am so thankful to have started the journey to provide safer alternatives for my family. I love the thieves household cleaner with a few drops of lemon in it. I absolutely LOVE Thieves cleaner and EO. I love keeping a small diluted spray bottle in my car, for cleaning my dash and just about anything else! I can’t wait to mix up some Thieves with baking soda and Lemon EO and clean the grout on my tile floors! Thieves Laundry detergent sounds amazing! I would love to give it a try on softball uniforms! I love both of these products. I like to add vinegar to my wash.